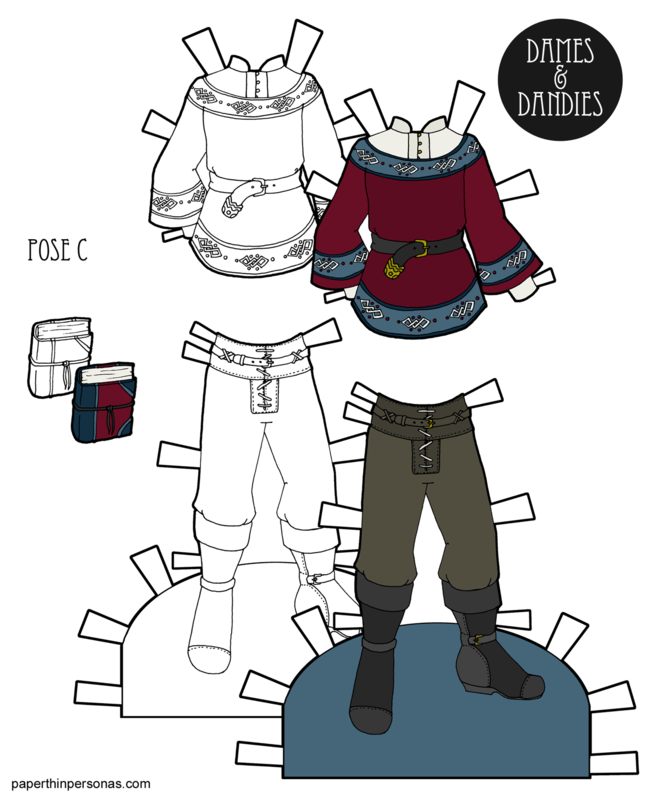 Printable Black & White PDF Printable Color PDF More Paper Dolls & ClothesSo, I wanted to try to draw some formal fantasy paper doll clothing. I originally created this fantasy outfit for the C Pose guys and I think of it as a kinda classic fantasy outfit in a style I draw a lot. I wanted to do a spin-off outfit that would feel more formal and refined- like if this was a peasant outfit, than today’s outfit would be a prince or something. In my head, the tunic is velvet over a silk shirt. I’m not sure what the pants are made of. Maybe something like really thin fine leather? Or perhaps a very nice soft wool? Silk wouldn’t stand up well to any sort of wear. Rather than my usual sword accessories, I decided a book was more fitting, though I’m sure he can borrow a weapon from here if he needs one. There’s an alternative color scheme available for my Patrons over on my Patreon page. Join if you want. It’s a fun group and I try to post content there every week from my sketchbook or other sources. Also, if you haven’t checked it out, I am doodling a dress every day and posting them to Instagram.